It’s been a busy week. The week before Holiday Break is always stressful. At school, my students were counting the days until Friday and the time off. Secretly, the teachers were, too. At home, my two kids were counting, B, my wife, is shopping and decorating our home in addition to all of the other tasks she does to keep the home running. During the school year it’s a delicate balance for me keeping up with school work, home jobs, and family. I am constantly procrastinating with tasks I should do at home so I can do something for school – grade, plan, or reflect. In the end, somethings just don’t get done. Like my desk – it’s a mess. I am behind on my Christmas cards, I need to write a note to my mom and step-mom and thank you notes to my students who remembered me this Christmas season. Regardless, I try to keep the kids engaged. I remind them to make the days count – to go beyond getting it done and to learn. We are covering the period in American history immediately before the Civil War. 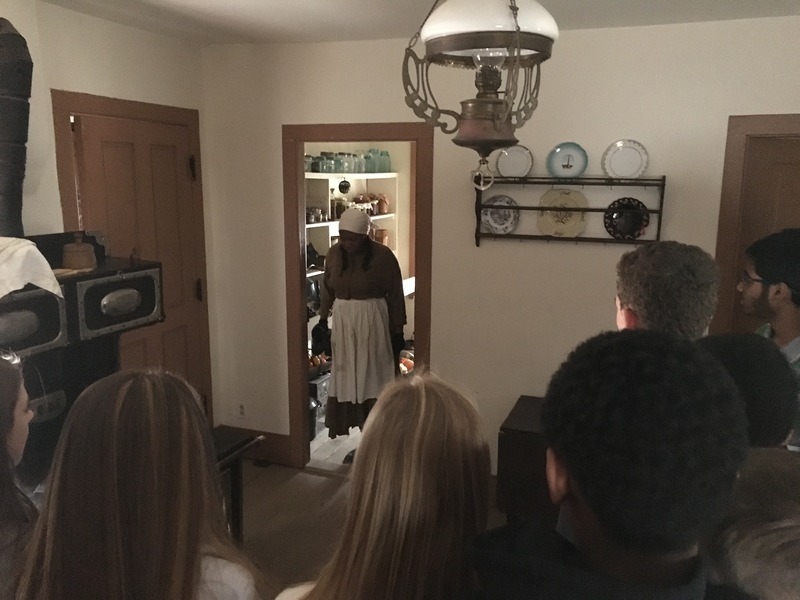 Last week my 8th graders took a field trip to the Naper Settlement. The settlement preserves the local town history and offers educational field trips for the local schools. I had gone last year and was impressed; this year I was excited to return and I promoted the field trip with my students.The field trip is more than a visit – it’s a re-enactment of history. The history of 1856. It’s pre-Civil War and the nation is tense. Abolition is the hot topic of the day and the Naper Settlement re-enacts the period with six separate scenes. Students travel from one location to the next encountering differing viewpoints on the slavery \ abolition issue. 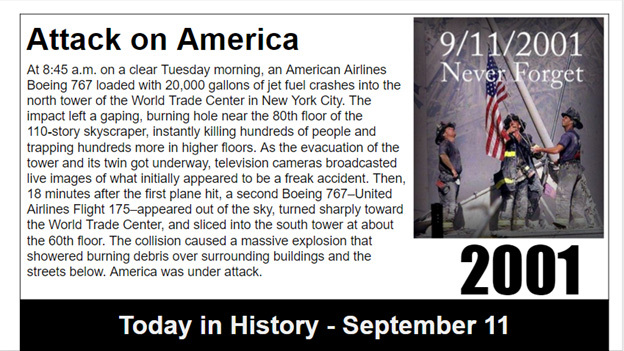 History, it is our story: there is always an event that happened on this day sometime, somewhere that is meaningful. Today is the 155th anniversary of South Carolina’s secession from the United States. Mississippi would follow on January 8, 1861. Nine more states would secede and the United States would be embroiled in a great Civil War, which would test the limits and resolve of our nation. 49 words. So much meaning. The politics behind the passage of the amendment is the subject of the movie Lincoln for which Daniel Day Lewis won an Oscar for his portrayal of Abraham Lincoln. Though most people in the North were opposed to slavery, many weren’t willing to step out and openly support the abolition of slavery. Article V in the Constitution lays out the procedures to amend the Constitution. Two thirds of the House of Representatives needs to approve any proposed amendment and three fourths of the state legislatures needed to ratify it for it to become law. President Lincoln pushed the limits of politics and Congress approved the amendment on January 31, 1865 by a vote of 175-56, a narrow margin of two votes more than was needed to send the amendment to the states for ratification. The United States had 36 states in 1865. The 36 included the 11 Confederate States that seceded, beginning with South Carolina on December 20, 1860 – one hundred fifty-five years ago tomorrow. Illinois was the first state to ratify the amendment on February 1. Georgia was the twenty-seventh state, ratifying the amendment on December 6. The amendment was formally adopted into the Constitution on December 18. History has a way of repeating itself, today we struggle with an assortment of issues that are clearly unjust for which we are unwilling to budge. A few push the issues and others push back. Abraham Lincoln spoke at the dedication of a military cemetery in southeastern Pennsylvania in November 1863. His remarks were short and to the point. It is rather for us, the living, to stand here, we here be dedica-ted to the great task remaining before us — that, from these honored dead we take increased devotion to that cause for which they here, gave the last full measure of devotion — that we here highly resolve these dead shall not have died in vain; that the nation, shall have a new birth of freedom, and that government of the people by the people for the people, shall not perish from the earth. 246 words, 246 powerful words. Today we remember Lincoln’s words, his deeds, and we honor his legacy. The Gettysburg Address. Initially, the speech was panned. Too short the critics claimed, but it has stood the test of time and is perhaps one of the greatest speeches in American History calling for us to re-dedicate ourselves to a new birth of freedom. A new birth of freedom is lost on some of our students and some of or citizens, it’s not lost on me. One vote meant the difference to the passage of the 13th amendment. One vote, one person, one moment. Over break, I have few books on my plate – all related to the Civil War and I’ll be re-watching Lincoln and Ken Burns documentary The Civil War. Looking for some angle to use with my students. Follow my books on Good Reads in the sidebar. What’s on your reading list this season? It’s Christmas time. The season is upon us. Christmas will be here in sixteen days. I’ve survived Black Friday – I didn’t shop, or even leave the house. I was four years old the first time the Charlie Brown Christmas first aired. It was 1965. We were living in Houston. We be there one more Christmas and then, we’d move to Sugar Land where I would grow up. My mom still lives in the house I call home, even though I haven’t lived there for close to thirty years. This year marks the fiftieth anniversary of the first showing of A Charlie Brown Christmas. The network produced a special 50th anniversary special and then replayed the cartoon. I watched it, again. Rewind, I can imagine us, my brothers and I, sitting on the couch watching the Christmas special in our jammies. For us, it was in black and white; we wouldn’t get our first color television until 1971. I don’t have a specific memory of watching it, I just know we watched it. Sitting on the couch. My kids have watched it, too. A lot has changed since then. I can watch A Charlie Brown Christmas anytime I want – regardless of the season. And, much has stayed the same, A Charlie Brown Christmas was, in a way, a protest show about the commercialization of Christmas. It bothers me that the Christmas season seemingly begins earlier every year. But, I don’t let it get me down. A few years ago, I purchased the music from the show and loaded it on my iPhone. I play it as often as I can. I plug in my speakers in my classroom and play it before school starts and sometimes in class when my students are working, no one tires of the tunes. The music is calming and peaceful and it reminds me of the importance of the season. I remember driving home to Ohio once – I don’t recall when. But, the backseat was in an uproar. My two backseat passengers couldn’t seem to get along, the dog was whining and barking, there was heavy traffic on the road and I popped in the CD. Presto, chango. We listened, whistled softly hummed, and thought of the gift of Christmas. We won’t be driving to Ohio this Christmas. I am not sure what our plans are, but it will be Christmas. But, wherever we go we will remember the meaning of Christmas. Yesterday was 9/11. We will never forget. Ever. For my students it was 9/11, they do not know. Most of them were not alive when the day unfolded and our world changed, forever. 9/11/2001 was my son W’s first day of pre-school – he was three. He remembers momma standing in front of the television crying and asking her what was wrong. Yet, it doesn’t have to be the day of the Bad News. 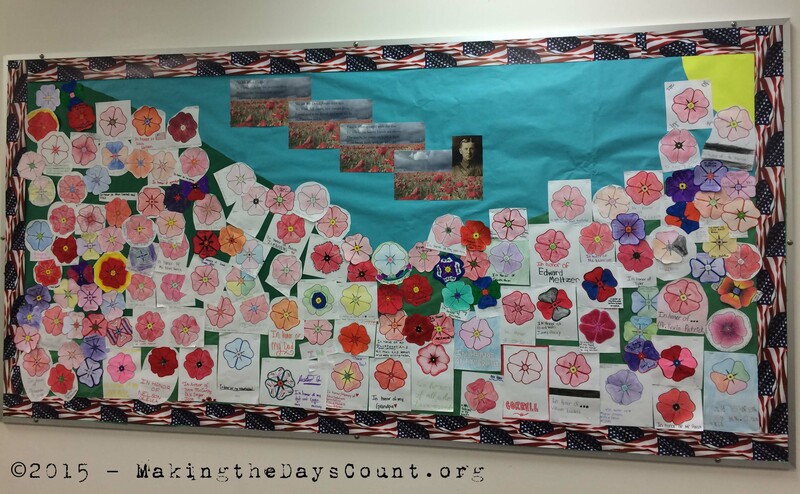 At school, we were looking for a way to mark the day and remember. The flag flew at half-staff, we observed a moment of silence, and the above ‘Today in History’ slide appeared in the daily announcements. Then, our school went about our day – learning, guiding, leading, assessing, re-teaching, and so many other verbs. We do it every day. After the announcements were finished, I showed the video below. Please take a moment to watch it – the video is 2 minutes and 19 seconds long. It will be time well spent, I promise. This fall, I’ll be teaching history full time for the first time in my teaching career. I am excited and I am worried. History gets a bad rap, especially with 13-14 years olds. Many folks believe history is remembering all sorts of dates and facts, and while that’s part of it, it’s not the reason we study history. We study history to learn from our mistakes and move forward as a people, as a society. This past year, I taught one section of history and it opened my eyes, again. American society seems to repeat itself every other generation – the issues my great grandparents faced, my generation faces today. In the 1840s immigrants – the Irish – were blamed for the country’s ills. Three generations later in 1900 – 1920s a different group of immigrants – eastern and southern Europeans were blamed, today it’s yet another group of immigrants longing for freedom. In the last quarter of the school year, I suggested a daily dose of history and volunteered to manage it. Administration ALWAYS appreciates initiative and follow through. Each school day I’d select an event and create a slide for the morning announcements. My colleagues knew I was behind it and let me know they appreciated the reminder of the importance of each day. Sometimes, I’d tweet it with my school twitter account – @ScullenWatkins. It’s Sunday, the day before Memorial Day, and the Indy 500 starts in less than a half hour. The pre-race is on and I wish I could watch it with my science students. It’s speed, physics, material science, and adrenaline all wrapped into 500 miles. 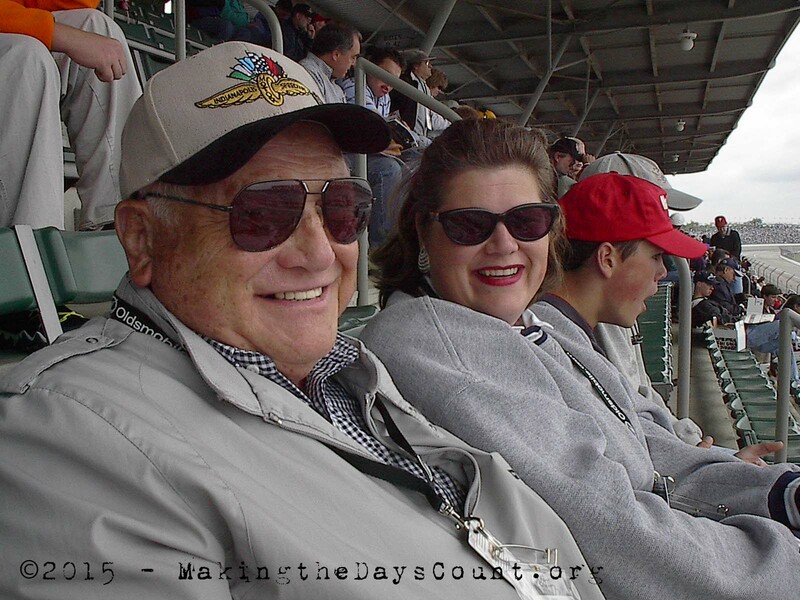 I’ve been to the race track many times before, but this year I’ll be watching from the family room with B, W, and O. We’ll be thinking of B’s dad who was our ticket to the track. JD passed away last year after a long life of service to his country, community, and his family. He’s always in our thoughts. In my last post, I honored my dad, whom also is never far from my thoughts, either. I’ve been teaching science for almost a hundred days now, ninety-two days to be exact. At the beginning teaching science was a huge shift in thinking and I always felt unprepared. But, lately, I’ve been feeling a bit more on top of things. My advanced science students finished their science fair papers, projects, and presentations this past week and all of the presentations are completed AND graded. Now, I just have to pore over their final reports and grade them. The district science fair was last weekend and several of the student’s projects are very good and have the possibility of advancing to the state science fair in early May. I am excited for them, they did all of the work and they own the credit. I was just a shepherd, of a scientific sort. I have two levels of science – advanced and regular – which means two curriculums and two separate plans. In regular science we’ve been focusing on matter and atoms; and we’ve finally gotten to the structure of the periodic table and how many electrons are in the outer electron shell. It’s really exciting stuff, trust me. In advanced science we are playing with aliens and looking for patterns. Click here for a web version of the activity. ALIENS.